Go to www.google.com/analytics and sign in/create an account with your Google ID. Follow the step by step set up process (I will do a post on this another time). 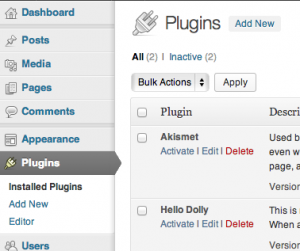 Sign in to your WordPress Admin portal. Search for “analytics” or I recommend a plugin called “Google Analytics for WordPress”. Enter your UA-12345678-1 code which you received from Google Analytics in step one in the text box that appears. Click the “Update Google Analytics Settings” button. It may take a few hours to start seeing some traffic on your site, but head over to your Google Analytics Dashboard to view your website’s statistics.